Today, very austere at first sight. 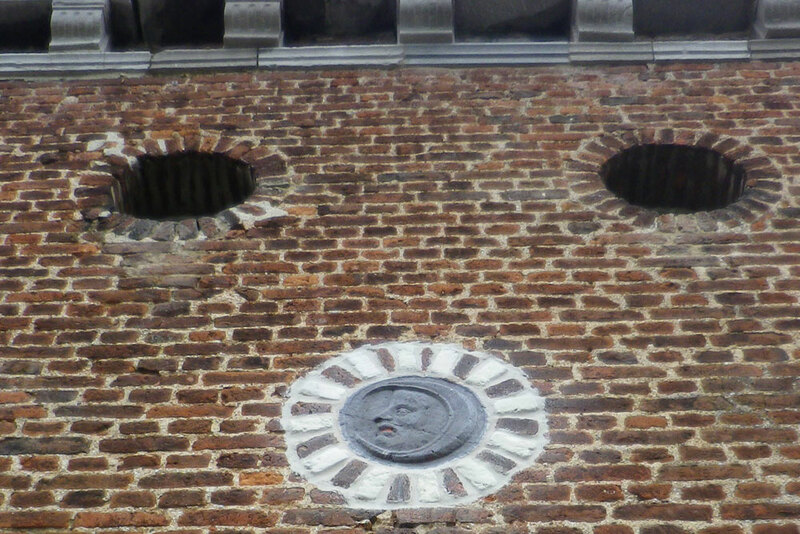 But pretty anyway when we look at the survey of the architect F.M. Brismoutier. The square tower dominates the building. Most likely, given the thickness of the walls, its bases are prior to the reconstruction of the castle by Alberto Audace. The tower is capped with a six-sided pinnacle. On the front facade, we see 3 limestone panels. The first vintage 1588 is stamped with the coat of arms of Alberto Audace. The second represents the coat of arms of Prince Bishop Ernest of Bavaria. While the third takes again the coat of arms of the Holy Germanic Empire with on both sides a cross of Saint Andrew in black bricks. 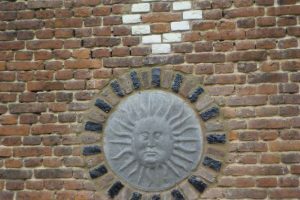 Note also a limestone struck with a sun and surmounted by four lozenges in white bricks arranged in a cross. This Maltese cross is the emblem of the Knights of Saint John who replaced the order of the Knights Templar. Let’s not forget that the castle has undergone many transformations over the centuries. Thus: The mullioned windows of the ground floor – still existing on the entire square tower – have been replaced by large windows. A second transformation has removed the oculi from the first floor in favor of larger windows. 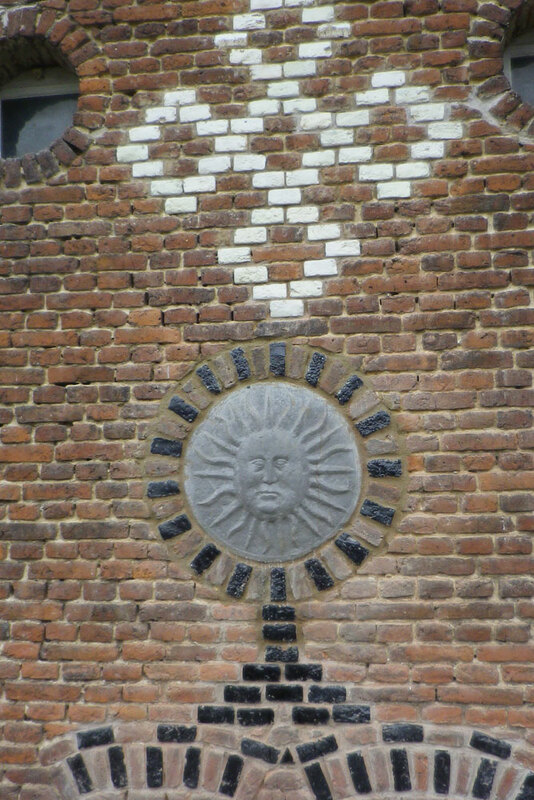 On the south facade of the tower, there is a limestone decorated this time of the moon. 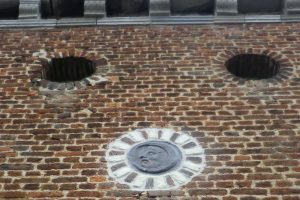 While above the front door, a large limestone cartridge marked Albert Armace’s coat of arms also indicates the year of construction of the building: 1588. As on the north facade, the oculis in the first floor gallery were closed and replaced by cross windows. While on the ground floor, the gallery was closed by a central door lined on each side by 3 windows. As you enter the paved courtyard, known as the commons, you may have noticed on your right the saddlery and the stables. This construction dates from the late nineteenth century, so it would have been ordered by the Hecking family. 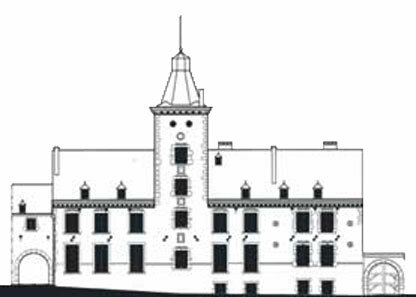 On the other hand, on your left, drawing the end of the main building, stands another small square tower. It was commissioned by the Baron de Loën Enschede in the 1920s, to the architect Balat. It housed a water tank fed by the ram pump of the garden. This water was then redistributed throughout the dwelling. 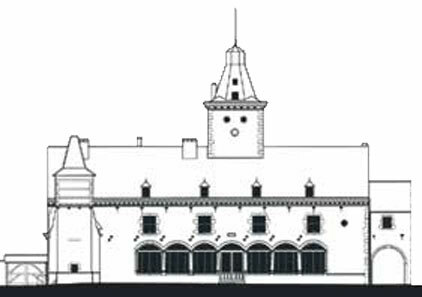 We invite you to consult the book “The monumental heritage of Belgium – Wallonia – 15 – Liège – Entity of Huy” for more theoretical details on the different elements of the building.